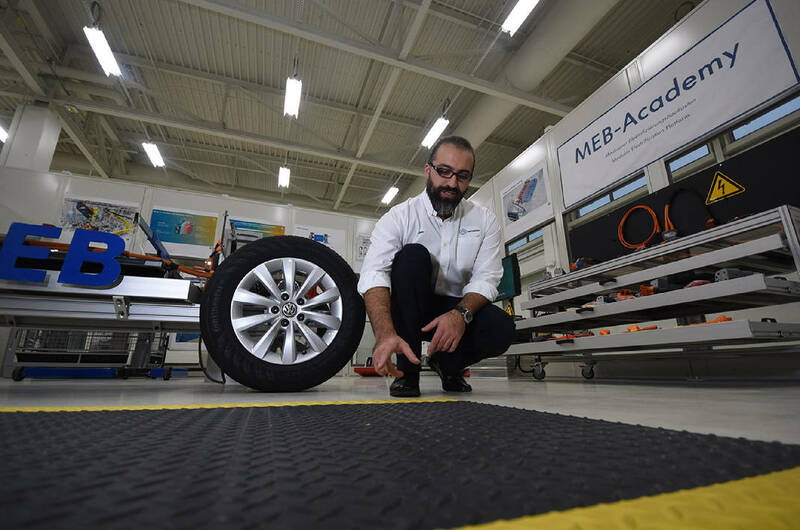 Ilker Subasi, assistant manager of technical training at Volkswagen Chattanooga, talks about an anti-static surface that VW employees can stand on while assembling electric vehicles at the plant. This story was updated Tuesday, March 19, 2019, at 6:16 p.m. with more information. SK Innovation, a South Korean company, broke ground on Tuesday on the factory to make lithium-ion batteries for electric and hybrid vehicles. "SK Innovation will supply lithium-ion battery cells for our planned electric vehicle production in 2022," said Amanda Plecas, head of communications for VW in Chattanooga. Volkswagen plans to start construction on its Chattanooga electric vehicle plant this spring. She said VW's Chattanooga EV plant, on which work is to start this spring, "has a commitment to create new jobs and use local suppliers." Plecas said SK Innovation plans to hire 2,000 workers at the Commerce, Ga., plant located about 65 miles northeast of Atlanta. Georgia Gov. Brian Kemp and U.S. Secretary of Commerce Wilbur Ross joined officials of the company in that state's largest economic development project since Kia Motors started vehicle production in West Point, Ga., about a decade ago. The SK Battery America plant is expected to produce batteries to power 250,000 electric vehicles per year at full capacity, according to the Atlanta Journal-Constitution. Jun Kim, president and chief executive of SK Innovation, said VW is located in Tennessee, Alabama is home to Daimler and Hyundai, South Carolina has facilities for Daimler, Volvo and BMW and Kia is in Georgia. "This is where the demand is concentrated," he said. Kemp termed the groundbreaking "an exciting day for all of us here but it's an exciting day for all hardworking Georgians out there for the opportunities they'll see in the future." Initially, the plant will have a production capacity of 10 gigawatts, which denotes the total power capacity of the batteries expected to be produced each year. SK Innovation's plant will be constructed in two phases, with both adding about 1 million square feet of manufacturing space and the hiring of more than 1,000 employees. Volkswagen plans to build an SUV starting in 2022 at the new Chattanooga electric vehicle facility that will go up adjacent to its existing production plant that builds the Passat sedan and Atlas SUV. The new Chattanooga plant will create 1,000 more jobs to go with the 3,800 already working at Enterprise South industrial park. The EV plant will hold what the automaker terms "the backbone of the technology" — a battery system located beneath the cars known as the Modular Electric Toolkit (MEB) platform on which all of the brand's electric cars will sit. "Everything is built on top of that" battery system, said Matthew Renna, vice president of the e-mobility product line in North America for Volkswagen. According to Volkswagen, it has secured a group of suppliers for battery cells in all the world's major regions at it gears up EV production. SK Innovation, LG Chem, Samsung and CATL will supply batteries for its growing electric vehicle fleet. SK Innovation will supply batteries for North America and a share for production of Volkswagen Group electric vehicles in Europe. Dr. Stefan Sommer, Volkswagen Group board member for components and procurement, said the four suppliers will help ensure VW "receives the best possible batteries – in all the variants we need to meet customer-specific and market-specific requirements." "This lays the foundation for the transformation of the Volkswagen Group towards e-mobility," he said. The Atlanta Journal-Constitution contributed to this story.